While trying to find gifts for my ‘adopted’ nephews, I came across some adorable organic plush animals by miYim. With lead being found in several toys and all those toxins in plastics, I wanted to get back to some of those more natural toys I grew up with, and I ended up finding some that are probably a bit better. 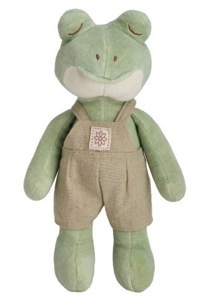 I chose baby ben, a cute raw organic cotton, naturally dyed sage green frog with overalls. From it’s beginnings as a seed, the organic cotton used for the plush fabric and stuffing is grown without pesticides or herbicides. Because the toys are all natural, toxicity and allergy levels are greatly reduced, lessening instances of sickness or irritation. Also, there is no need to coat the fabric with chemicals; in it’s raw state, the fabric is naturally softer than regular cotton. They use a process called PureWaterWash™ to achieve their charming colors, dying the unbleached, unprocessed, untreated cotton with nature’s own plants and minerals, including chestnut bur, clove, and gardenia seed. These contribute to its unique coloring, making each one a little bit different. I found mine at the local toy store in Downtown Seattle, Magic Mouse for $24.00, A great price to pay for such a well made and eco chic baby toy.